"YOU ARE COME TO MOUNT SION TO THE CITY OF THE LIVING GOD THE HEAVENLY JERUSALEM AND TO THE COMPANY OF MANY THOUSANDS" -- the inscription in the mosaic. Christ in Glory, from Art in the Christian Tradition, a project of the Vanderbilt Divinity Library, Nashville, TN. http://diglib.library.vanderbilt.edu/act-imagelink.pl?RC=55288 [retrieved April 24, 2019]. 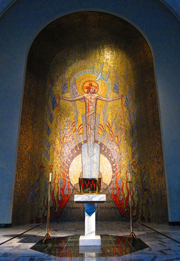 Original source: http://commons.wikimedia.org/wiki/File:Saint_Charles_Seminary_(Carthagena,_Ohio),_Chapel_of_the_Assumption,_tabernacle_and_mosaic.jpg.